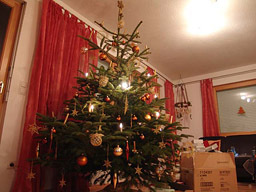 just in time for christmas, here’s our christmas tree from last year. actually, the video shows my mom decorating it, fast forward. the ornament stars you can see in the video are home-crocheted, as are the golden balls.